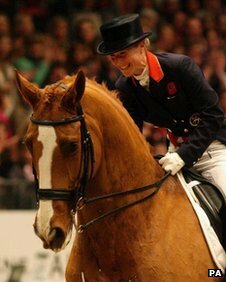 Gloucestershire’s Laura Bechtolsheimer will be Britain’s sole representative at the Reem Acra FEI World Cup Dressage qualifier at Neumunster, Germany this weekend 18 – 19 February. It will be the long-awaited international debut for her father, Wilfried’s Tellwell. The 12 year old Swedish Warmblood by Tip Top 362 has been with the Bechtolsheimers for nearly three years and Laura has taken time with his training to build the partnership. 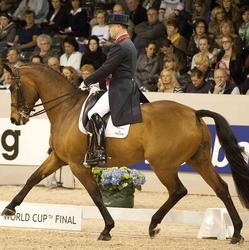 The horse represented Sweden as a five and six year old at the World Breeding Championships and won the 2009 Medien Cup qualifier at Grand Prix level in Wiesbaden under Patrik Kittel. His first competitive outing with Laura last month at Addington proved he’s a star prospect when winning the Grand Prix with 71.06%. Other top names on the entry list include a strong showing from the home side in Nadine Capellmann, Helen Langehanenberg and Isabell Werth plus Hayley Beresford (AUS), Catherine Haddad Staller (USA) and Catherine Rasmussen (NOR). The Grand Prix is bright and early on Saturday morning starting at 8:30am (7:30 our time) while the Freestyle is on Sunday with a 9:55am start (8:55 for us). Britain’s dressage riders strengthened their Olympic title credentials by sweeping the top four places on successive nights at London’s Olympia. Though some key rivals were absent, the result illustrates Britain’s increasing prominence in the sport. GB won their first European team title in August. “These are three of what seem to be the top horses in the world,” said Carl Hester, who led Britain to European glory in Rotterdam and picked up two third-places finishes at Olympia this week on board Uthopia. A British team has never before posted such strong dressage results. Bechtolsheimer and Dujardin, 25, form a youthful core for the British team. Dujardin has spent almost five years working for and learning from Hester at his yard – she calls her GB team-mate “grandad” – and she hailed 2011 as her breakthrough year. “I’m still learning and getting to grips with it all, but for a nine-year-old horse to go in there and do that, you have to pinch yourself,” she said. Congratulations to WOW-sponsored Richard Davison, who placed fourth in both the Grand Prix and the Freestyle, riding Hiscox Artemis!